With thanks to Denis Pickles for providing the scan and text. "Pennine Summers are often unseasonal. On August 8 1938, the West Riding was lashed by thunderstorms, that at Sutton being deemed 'the worst experienced within living memory'. Streams from the surrounding hills became torrents, walls were washed away, houses, shops and cellars flooded. Sutton beck rose by three feet and burst into the road whilst swollen Holme Beck reached the arch of the bridge. The Park Lake covered three times its normal area. This was the scene near Holme Bridge that Monday evening, where the younger element at least seem to be enjoying the spectacle. 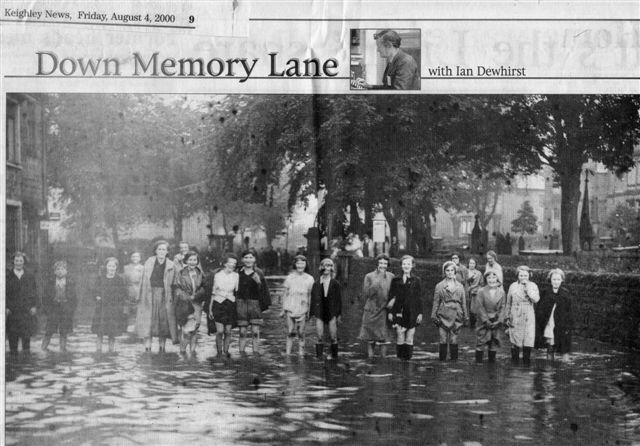 The photograph was supplied by Howard Stowell now of Hampshire, whose uncle, Willie Laycock, a well known local tenor, was choirmaster and for 25 years caretaker at Sutton Baptist Church, seen here in the background on the right."